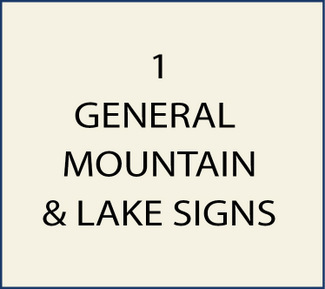 This Section 1 of Gallery 21 shows photos of custom property name/address signs for mountain, forest,and lake residences and businesses. The signs in this section have text and either no art or simple art ; they are miscellaneous signs that do not fall into one of the other 14 categories for the sections below, in this photo Gallery. These signs are carved in High-Density-Urethane 2.5-D with 3 or more levels of relief, or they can be engraved. There are no 3-D carved signs in the section; however, there are many 3-D signs in the other sections in this Gallery. These signs are hand-painted with an artist brush or airbrush. They are clear-coated twice for additional UV protection, and will last decades. These signs may be hung near the residence or business entrance, mounted on a wall, a gate, a post, or hanging from a wrought iron scroll bracket mounted to a post or a roof eave.